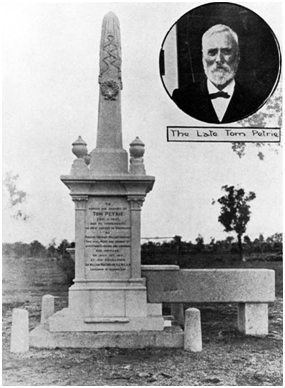 Tom Petrie passed away in 1910 and was honoured the following year when the Governor of Queensland, Sir William MacGregor unveiled a monument in his memory. 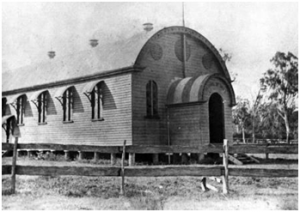 At the same time, the name of the township that had grown where Tom had settled some fifty years earlier was changed from North Pine to Petrie. Many people in the area were opposed to the change and the debate raged in the community for years afterwards. When first erected, the monument stood about fifty metres from the School of Arts on the opposite side of Redcliffe Rd. The 15 ft 6 in. (5 metres) high structure consisted of a sandstone obelisk with a marble tablet set into its surface on which Tom Petrie’s epitaph was inscribed: “Pioneer, Patriot, Philanthropist.” A stone water trough connected to a nearby windmill lay alongside the monument. A tap and small bowl on one side allowed people to drink. The monument has since been moved and now stands in front of the School of Arts building. SIR WILLIAM MACGREGOR, C.C.M.C., C.B.